Barry Sorrels is one of the most respected criminal defense lawyers in Texas in both state and federal courts. He represents clients in all criminal matters from serious state offenses to complex federal fraud cases. Because he has earned the high regard of the Dallas legal community, Barry was honored to serve as the 2011 President of the Dallas Bar Association and is the 2017-2019 President of the prestigious Patrick E. Higginbotham Inn of Court. Still, he is best known for his career in the courtroom. After a spending a few years as a Dallas County felony prosecutor, the great majority of Barry’s career and successes have come as a criminal defense lawyer. Most of Barry’s clients are highly successful people: politicians, business executives, professional athletes, doctors, healthcare professionals, pharmacists, and law enforcement officials. He regularly represents friends and family members of lawyers and judges. Recently, he was asked by the Dallas County District Attorney’s Office to represent one of their assistant district attorneys in a contempt matter. From the first meeting with a client, Barry starts preparing a strategy for trial, for maintaining his client’s reputation and future in the community, and for managing publicity if the case has been addressed in the public forum. Barry often works with civil law firms who have clients with collateral criminal issues, and he is an expert on crisis management as well as the 5th amendment issues that often arise in civil cases where criminal acts have been alleged. Whenever Barry takes a case, he brings a seasoned group of investigators, appellate specialists, and experts. Through his years of practice, Barry has learned that complex matters where life and freedom hang in the balance demand a team approach. He is very comfortable leading a team of experts through the difficult process of investigation, preparation, and trial. Preparation is the key to any litigation success, and for that reason “Victory loves preparation” is a mantra in the office. Barry believes that whether a case is resolved by agreement, in front of a judge, or in front of a jury, proven trial lawyers get the best results for their clients. Though many of his best outcomes for clients are the cases where he has prevented a case from being filed by law enforcement or indicted by a grand jury, Barry earned his reputation from his excellent results in the courtroom. He is one of the elite trial lawyers in this state. Barry’s trial skills extend to both federal and state courts. He has won acquittals for his clients on charges as serious as complex federal fraud cases and first degree murder. He is one of a handful of criminal defense attorneys who has obtained a jury verdict of not guilty by reason of insanity. Barry is listed in Best Lawyers in America for criminal defense and was selected Top Criminal Defense Attorney in Dallas for 2011. Texas Monthly magazine named him one of the “Top 100 Lawyers in Texas,” and he has been voted by his peers as a D Magazine Best Criminal Defense Attorney every year since 2003. He was one of four Dallas attorneys invited to participate in the Dallas Bar Association’s Learn from the Masters trial demonstration in front of an audience of hundreds of lawyers. Since 2015, D CEO magazine has named Barry as one of the few criminal defense lawyers recognized in the Dallas 500 which represents the city’s top business leaders from various industries. 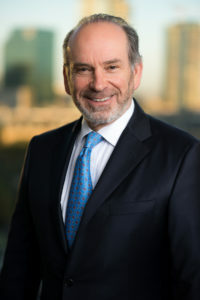 Through his regular commentary for local and national news outlets, Barry has earned a reputation as an expert legal analyst in criminal cases. He has appeared on CNN, FoxNews, MSNBC, CourtTV and most local DFW news stations as a legal expert. Barry has served on the United States District Court for the Northern District of Texas Federal Court Advisory Committee 2009-2016. In 2013, he was one of five attorneys appointed by the Chief Judge of the United States Fifth Circuit Court of Appeals to the committee to recommend a new Public Defender for the Northern District of Texas. Barry serves on the Texas Pattern Jury Charge committee. He is on the board of trustees of the Center for American and International Law and is the course director for the Center’s Trial Skills and Trial Law Program, where he teaches young lawyers criminal defense skills.